Last Sunday was my lovely husband Tom’s birthday. It was also Superbowl Sunday, so you know what this sports-obsessed household is doing — even though the Packers are not in the game. Let us pause for a moment of mourning for the Packers and their fans. Tom and I like to hike on our birthdays. Since we live in Wisconsin, this is not always possible, even for hardy folk like us. Luckily, last Sunday was in the 40s and sunny, much kinder weather than we had any right to expect. We are lucky enough to live 10 minutes away from Hartman Creek, a beautiful state park. The last time we hiked there, on my birthday, Libby flew out of the car like a rocket and had her own personal tour of the park while Tom and I followed in a panicky manner, screaming “Hey Libby! Come!” in maniacally happy voices for 20 minutes. Libby finally showed up when Tom sat himself down in the middle of the path with Cleo, on-leash and calm, at his side. Since it was his birthday, Tom got to choose the menu for dinner. We started with some basic guacamole (mashed avocado, minced onion, lemon juice, salsa, salt and pepper) and chips as a pre-game snack. Luke was off to a Superbowl party with his friends, so it was just us. 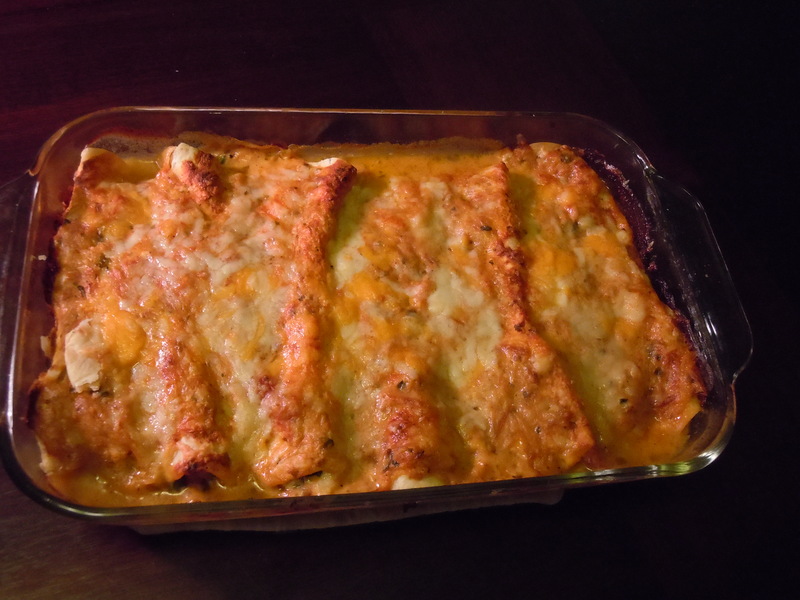 For the main course, he chose chicken-spinach enchiladas, a dish I’ve been making for years. It’s evolved from the original version, a vegetarian filling of spinach and onions with a rich chili-cream sauce. I’ve toned down the fat level and boosted the protein. It’s one of Tom’s all-time favorite dinners. 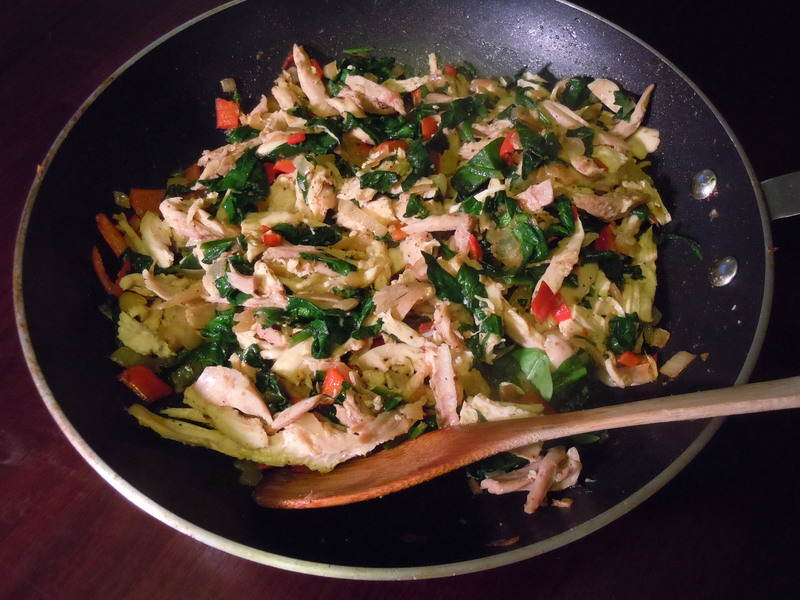 The filling mixture is pictured above: onion, garlic, chiles, chicken and spinach. I could easily just eat that straight out of the pan. But the next step is to fill tortillas with that gorgeous mixture. They’re nestled in a creamy/spicy sauce, topped with cheese, and baked until everything’s bubbly under a golden crust. In a small bowl, stir together the salsa and sour cream. Set aside. Heat the oven to 400 degrees F.
Heat the oil in a skillet over medium heat. Add the onion, chile, and garlic. Sauté for about 5 minutes until the onion is tender and a bit browned at the edges. Add the aleppo, the spinach, and a few tablespoons of water. (If you opt for frozen spinach here, just squeeze it a bit and don’t add any extra liquid.) Cook for a few minutes until heated through. Add the shredded chicken, stir to combine, and set aside. Spread the tortillas on a cutting board or on your counter. Stir about 1/4 cup of the reserved sour cream-salsa sauce into the chicken mixture just to moisten the filling. Divide the filling evenly between the tortillas. Top the filling with about 3 tbs. grated cheese per tortilla. Roll each one up and place, seam side down, into a 7×11-inch baking dish. Spoon the remaining sour cream-salsa sauce over the tops of the tortillas. Sprinkle with the remaining cheese. Bake for about 30 minutes until the sauce is bubbling and the cheese is browned. This entry was posted in main courses, meat, poultry,and fish and tagged casserole, cheese, chicken, mexican, one-dish dinners, salsa, spinach, tortillas. Bookmark the permalink. This sounds and looks scrumptious. Thanks! Looks difficult but it is oh so easy. I served these last night and everyone loved them. Great! Let me know what you do differently. And enjoy! I made them last night! I used the rest of a rotisserie chicken that my hubbie brought home the other night and made some sauce from frozen tomatoes from my garden. I mixed the sauce, some plain greek yogurt and the chicken together with some grated cheese. Filled flour tortillas with the mixture and more sauce and cheese. Rolled them up. Then topped everything with more sauce and cheese and baked until melted and hot! They were great! Melissa, the Greek yogurt is a great idea–I’ll try that next time. Thanks, Jennifer. I’ve been waiting for the days to be long enough so that I can photograph in sunlight, so I appreciate the compliment.